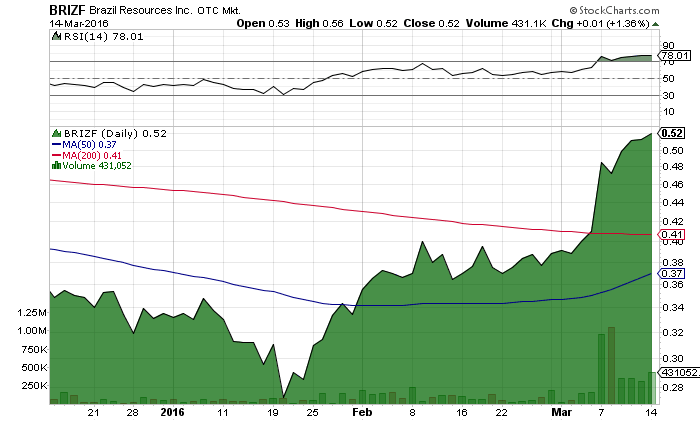 BRAZIL RESOURCES I COM NPV (OTCMKTS:BRIZF) has surged on recent developments of a private placement deal. The company had previously announced closing its private placement offering of $3.4 million in capital raised consisting of approximately 7.54 million common shares. However, due to oversubscription and demand, BRIZF increased the private placement amount to $4.5 million and today announced that it had closed its final tranche of $1.1 million consisting of 2.45 million common shares at a share price of $0.45. BRIZF has raised $4.5 million with the issuance of roughly 10 million common shares. The original private placement was pegged to be at $2 million but has seen such demand that it has been increasing the amount to help with its current projects. The terms of the private equity are relatively vague but expect to see warrants that may be downward pressure on the share price if it reaches the exercisable levels. BRIZF has recently hit a new 52-week high of $0.63 and the stock price hit an intraday high of $0.56 closing the day at $0.52 with a gain of 1.36%. Volume has been quite impressive as the gold mining and exploration sector has surged because of the rally in gold prices and central banks increasing their monetary policy bets. BRIZF has recently accelerated past its 50 day moving average of $0.41 and its 200 moving average of $0.37. A golden-cross is starting to appear as the 200 daily moving averages is beginning to slope upwards. The stock has surged over 100% since putting in all time low last year. BRIZF is a public mineral exploration company with a focus on the acquisition, exploration and development of projects in Brazil , United States , Canada and other regions of the Americas. Brazil Resources is advancing its Whistler Gold-Copper Project, located in Alaska , United States , its Cachoeira and São Jorge Gold Projects, located in the State of Pará, northeastern Brazil , and its Rea Uranium Project, located in the western Athabasca Basin in northeast Alberta, Canada . BRIZF is currently trading at a $43 million market valuation. BRIZF is close to breaching its prior 52-week high and could be setting up to make a surge forward. The recent financing should provide adequate capital to continue its projects that will hopefully be revenue generating in the future. This exciting story is just beginning. Stay tuned for more developments and alerts. We will be updating on BRIZF when more details emerge so make sure you are subscribed to Microcapspot so you know what’s going on with BRIZF. Disclosure: we hold no position in BRIZF either long or short and we have not been compensated for this article.